Who deserves the title of Rochester’s most influential musician? Is it the Delta bluesman Son House, who lived in the Corn Hill neighborhood for twenty years? Perhaps it is the world renown Soprano opera singer and Churchville-Chili graduate Renee Fleming. Or maybe it is Lou Gramm, the lead singer of Foreigner and hometown darling. For my money, this title belongs to the incomparable king of “Hi-De-Ho,” the prince of swing, the greatest bandleader of his generation, and legendary ambassador for the art of Jazz, Cab Calloway. 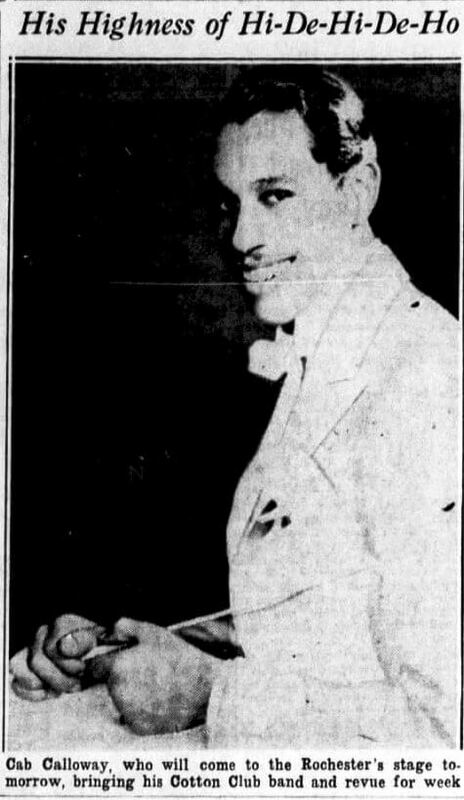 Although Calloway moved to Baltimore during his high school years, got his beginning as a performer at the Dreamland Ballroom in Chicago, and spent the rest of his stardom in the clubs of Harlem and on tour, the Flower City will always be his first home. Born on Christmas Day in 1907, Calloway’s international legacy will forever be tied to this unique community of humble pig farming origins. The neighborhood mascot references the humble origins of a community founded on the raising and selling of pigs. Kids Fishing Derby at Brighton Town Park. And a fish story.